As we head toward the Autumn Equinox (AKA: Harvest Home/Mabon/Feast of Avalon), apples play an important role both in this harvest festival as a symbol of abundance and in the upcoming Samhain, where it specifically is used for divination. 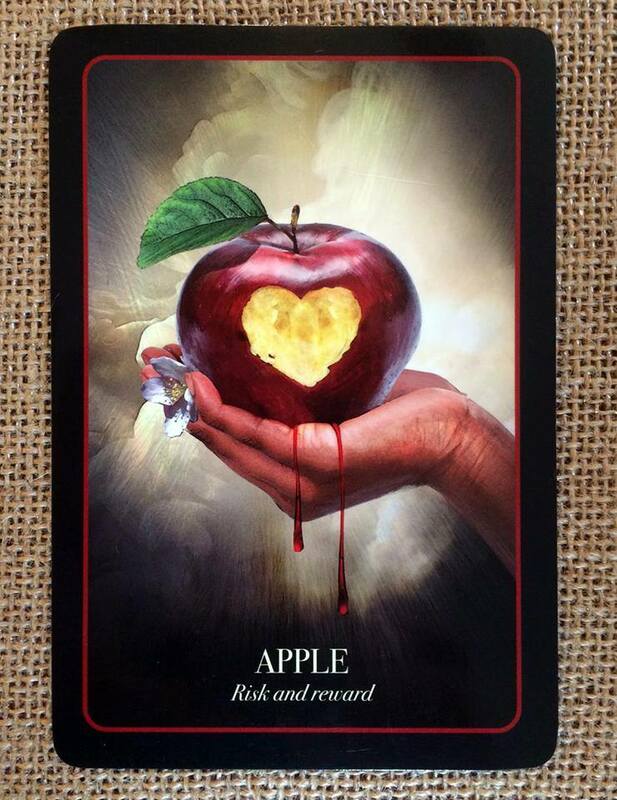 But here with this card, we are reminded that the apple has been connected symbolically in other ways: In the story of Adam and Eve (even if that’s not the correct fruit), the poison apple of fairy tales, and more. Consider your risks and rewards, whether you need to take more chances or perhaps be less reckless. Apples have been a symbol of Samhain for a very long time. Apples, when cut in half, have a seed pattern that looks like a pentagram and so the Celts held the fruit to be sacred. Bobbing for apples, a game traditionally played at Halloween, has its origins in the Samhain festival and is one of the oldest associated with this celebration. The traditional way to play is to place 3 or 13 apples into a barrel of water and the game is to try and bite an apple whilst it floats and bobs in the water. Hands must not be used and people often compete with each other, bobbing at the same time. It is believed that the Romans brought the custom to Britain and there are quite a few images recorded through art of the activity in both cultures. It was said that unmarried women who placed the apple they had bobbed under their pillow would dream of their future husband. In Newfoundland and some parts of Ireland even today, Halloween is called Snap Apple Night. Candy apples (apple on a stick covered in toffee), although not quite as popular now as they once were as Halloween fare, are now making a comeback as a fun and simple treat to prepare on this night. Apples have been an iconic part of mythos from ancient times to modern – the story of the poison apple in Snow White, to the Roman Goddess Pomona’s magical apple tree, to the Christians’ tempting fruit in the Garden of Eden. Should you receive this “Apple” in your reading, it’s time to look at how risk plays out in your life. Are you hedging your bets and not trying anything new? Do you want change but are not willing to change anything? Are you willing to risk to get a greater reward? Or alternatively, are you risking too much, too often?